Summary: Use Office 365 PowerShell to manage SharePoint Online site groups. Although you can use the Microsoft 365 admin center, you can also use Office 365 PowerShell to manage your SharePoint Online site groups. 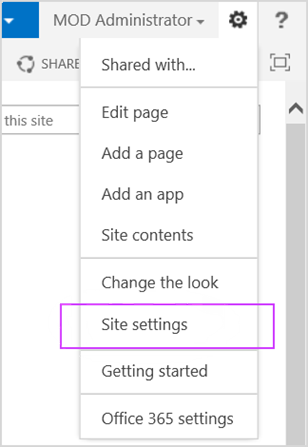 The procedures in this article require you to connect to SharePoint Online. For instructions, see Connect to SharePoint Online PowerShell. From the Microsoft 365 admin center, click Resources > Sites, and then click the URL of the site. In the site collection dialog box, click Go to this site. On the Site Settings page, click Sites permissions under Users and Permissions. And then repeat the process for the next site you want to look at. Copy the commands into Notepad (or another text editor), modify the value of the $siteURL variable, select the commands, and then paste them into the SharePoint Online Management Shell command prompt. When you do, PowerShell will stop at a >> prompt. Press Enter to execute the foreach command. These are all the groups that have been created for the site https://litwareinc.sharepoint.com/sites/finance, and all the users assigned to those groups. The group names are in yellow to help you separate group names from their members. 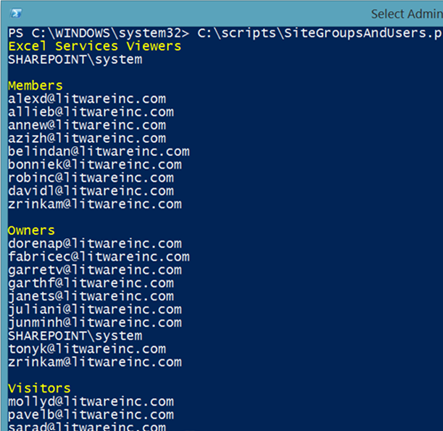 As another example, here is a command set that lists the groups, and all the group memberships, for all of your SharePoint Online sites.